Former Dewsbury and Batley centre Shaun Squires has joined Shaw Cross Sharks. Shaw Cross Sharks have swooped to sign former Dewsbury Rams and Batley Bulldogs centre Shaun Squires. 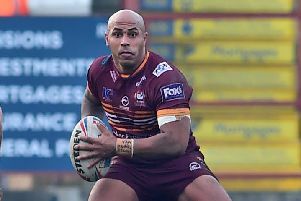 Squires made a big impact during his debut at Batley in 2015 when he made 27 appearances and scored 12 tries but was then restricted to just 10 games in 2016, during which time he scored five tries. Squires joined Dewsbury last season and made seven starts and another two appearances off the bench and scored three tries. His last appearance in Rams colours came in the 36-22 Championship Shield semi-final defeat at Toulouse Olympique on September 23 and he has now decided to return to his amateur club Shaw Cross. Former Rams forward Zach Johnson has taken over as head coach at the Sharks for 2018 and he also signed Coventry Bears player Eddie Medforth. The Sharks saw their Ladbrokes Challenge Cup first round tie at home to Beverley postponed last Saturday after Kirklees again closed their Council owned pitches. The sides will try again this Saturday (kick off 2.30pm). The Sharks are also hoping to resurrect their A team in 2018 and have appointed former first team captain Danny Flowers as their new second string coach. Flowers has been forced to retire due to a reoccurring shoulder injury but is relishing the chance to move into coaching. Flowers said: “I still want to be involved in the club, and coaching the A team is a great opportunity to do that and, if needed, I may still be able to play occasionally. “I have coached Under-18s before and I saw this as a good chance to make the step towards open age. “We lost the team last year, but we still want to get two strong teams out every week this year. Johnson’s Shaw Cross begin the new National Conference League Division One campaign with a trip to Ince Rose Bridge on Saturday March 10, while their first home game is against Leigh Miners Rangers the following week.